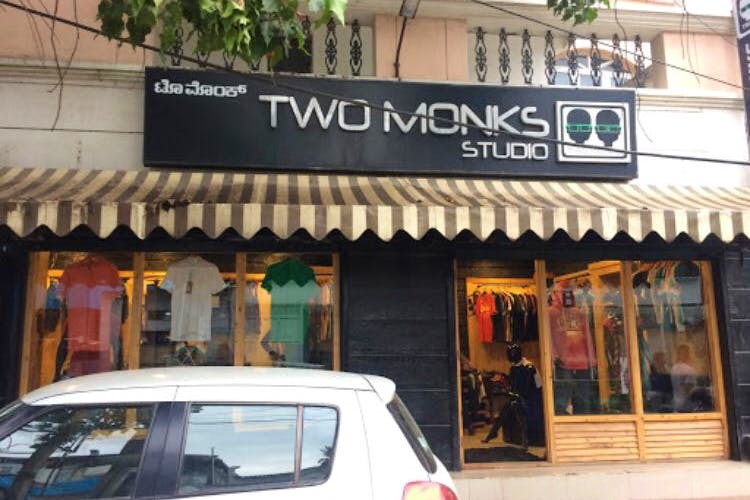 Two Monks Studio in Koramangala is your one-stop-shop for new outfits and rocking those #OOTD goals on a budget. Just opposite Haji Ali Juice Centre, Two Monks Studio is a small studio that stocks up on all kinds of hip options for both men and women. Ladies, while your collection extends to simple tops to party-ready dress and crop tops to tees, men, you will be happy to browse through the extensive collection of jeans, flannel shirts, graphic tees, and boxers. Accessories are limited to just wallets and belts. The flannel shirts for men are quite the rage here with the store often running out of stock often. But drop in your number at the store counter, and you will get updates whenever new collection arrives. Jeans are either skinny or slim-fits, though we did spot a collection of joggers as well. While some pairs are ripped, you will also find a bunch of pairs that you can wear to work on Casual Fridays. Graphic tees and boxers are for anyone who loves bright colours. The store works out for anyone looking for a quick pre-party shopping mainly because of its budget-friendly inventory. You could pick out a new tee for as low as INR 599 or even a new pair of jeans around INR 900. Boxers and accessories start around INR 300 upwards. For ladies, tops and tees start at INR 599 upwards, while dresses start around INR 900.